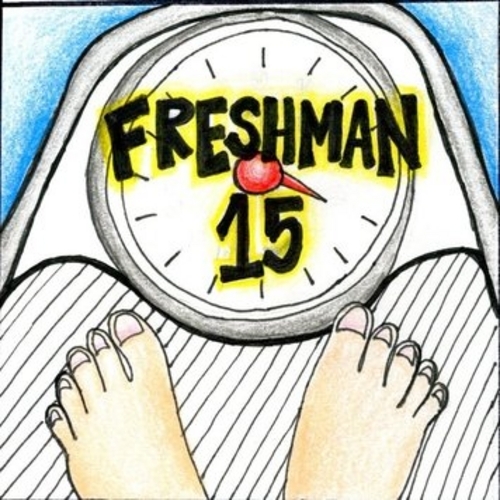 Dorm food, historically, has carried with it a reputation of flourishing in fat, salt and starch, thereby placing extra pounds onto unsuspecting freshman. Hence, the term “freshman 15” was coined. Indeed, a quick look at some cafeteria menus would seem to confirm this notorious reputation. Chicken fingers, French fries, onion rings, hot dogs, grilled cheese, etc. are all rife with fat. But wait! There’s more! Now there are ways students can eat healthfully in the campus cafeteria. According to Jessica Lively, Director of Food Services at Hilbert, there are several ways conscientious Hilbert students can increase nutritional content and lessen consequences. The Hilbert College Cafeteria offers a daily menu of quick, traditional food. And, yes, the food selection is usually along the lines of large-crowd pleasers, such as scrambled eggs, bacon, and muffins for breakfast, hot dogs, chili, and “junk plate” for lunch, and meatloaf, pizza and barbecued chicken for dinner. But, did you know that you can eat healthful items on a regular basis, also? The first thing that comes to mind is the salad bar. The salad bar is stocked with two kinds of lettuce (refreshed several times per day), onto which can be added a multiple assortment of vegetables, fruit, cheese, and more. During a recent visit to the dining hall, I noted these healthful choices: Mesclun and romaine lettuce, peas, broccoli, sliced cucumbers, tomatoes, olives, red and green bell peppers, spinach, mushrooms, carrots, garbanzo beans, cauliflower, hard boiled eggs, ham strips, mixed fruit, onions, banana peppers, cottage cheese, shredded cheddar, and more. Also available was pasta salad and fruit-flavored yogurt. There were 13 kinds of salad dressing, including oil and vinegar. Now, even though the salad bar is among the best places to find proper nutrition, there are some guidelines to follow. Stay tuned. The next thing Lively pointed out was a new system she is using, involving meal tickets. If someone chooses to go this route, he or she is given a breakfast, lunch or dinner ticket with items to be circled. Examples of choices on these tickets are omelets for breakfast, turkey avocado sandwiches for lunch, and a grilled chicken dinner. These tickets are sent to the short-order cook and are usually ready in five to 10 minutes, according to Lively. Also on these tickets, students can make requests, such as substitutions, side dishes, and omissions. In addition, they can choose whole grain bread, spinach wrap, what to have in their omelet, and more. Drink a glass of water before you eat. Chances are, like most busy people, you are a bit dehydrated. Drinking water will hydrate and energize you, and it will make you less likely to overdo it calorie-wise. Then choose skim or 1% milk, unsweetened iced tea, or water instead of pop. High-caloric beverages are the stumbling block for many diets, because people don’t think of them as having calories. The truth is that the beverage actually can contain a large percentage of the meal’s calories. Get to the cafeteria before the big rush so that you can order meals in a timely manner with the meal tickets. Lively says noon and 6:00 p.m. are the heaviest times. If you can get there a half hour early, you will have your special order in less time. For Breakfast: The Veggie Lovers’ Omelet light on the cheese (and you can write that in on your ticket), whole wheat toast, the Healthy Hilbert and Veggie Hawk egg sandwiches, the Skinny Wrap with a spinach tortilla (which you can write on the ticket, as well), orange juice and skim milk. Breakfast is still the most important meal of the day. Don’t skip it. You will consequently eat more at lunch and dinner to compensate. For Lunch: The Turkey Club sandwich, the Grilled Chicken sandwich, the Turkey Avocado sandwich, the Grilled Chicken wrap, and the Roast Veggie Wrap. It is important to note that you want them light on the mayo. For Dinner: The Grilled Chicken Wrap, the Roasted Veggie Wrap, and especially the Grilled Chicken Dinner. Choose to eat from the salad bar a few times per week, perhaps for lunch every day. The lettuce is changed regularly, so it is always fresh. One of the best guidelines for the salad bar is don’t stack your plate too high. Forego the macaroni salad in favor of veggies and protein items. Protein items include meat and hard-boiled eggs. Cheese also has protein, but you should use it sparingly, since it is usually fattening. It is true that the biggest mistake dieters make at the salad bar is loading up on dressing. Be conscientious about how much dressing you use. Oil and vinegar, Balsamic Vinaigrette, Fat Free Raspberry Vinaigrette, and Salsa are the best choices at Hilbert Cafeteria. Use only two tablespoons, if possible. If you accidentally took too much food, don’t be afraid to eat only half. Nobody at college is looking over your shoulder to make sure you cleaned your plate. Give yourself enough time to eat. The common recommendation is to allow 20 minutes or more for your stomach to send the signal to your brain that it is full. This means you need to budget your time well, so that you can actually sit down and eat, instead of running to class, high-caloric muffin or fried-chicken-fingers-to-go in hand. Change your mindset. The campus cafeteria is not an all-you-can-eat restaurant that you visit once or twice per year. Choose to eat less. Worry about your waistline instead of getting the most from your already-spent room and board payment. Use moderation. Finally, we all know that many of us live for fattening foods. If that is you, you don’t have to give them up entirely. Just eat them in moderation. For many people, that may mean saving dessert for one day a week. For others it means eating only half of what you used to eat.